Week 9 is a cute block designed by Bobbi Bridgeman. This famous face needs no introduction! 'Rudolph', instantly recognisable. What says Christmas more than everyone's favourite reindeer? Fabric chosen, pattern printed, let's get started! I'm beginning to think it might've been a good idea to label the pieces as I cut them. This could be a long afternoon. Do you ever get the feeling you're being watched?? This block is going together easily. Thanks to Bobbi for the detailed instructions including directions for pressing seams, can't go wrong! Don't you just love this cute face? I know, I know since when did Rudolph have silver antlers? Well ever heard of artistic licence? I just couldn't resist giving him silvery Christmasy antlers. Since I found this fabric I intend to make the most of it. Finished! I love this block. There was no guesswork in construction, it came together beautifully. Many thanks Bobbi for this great design and great instructions too! 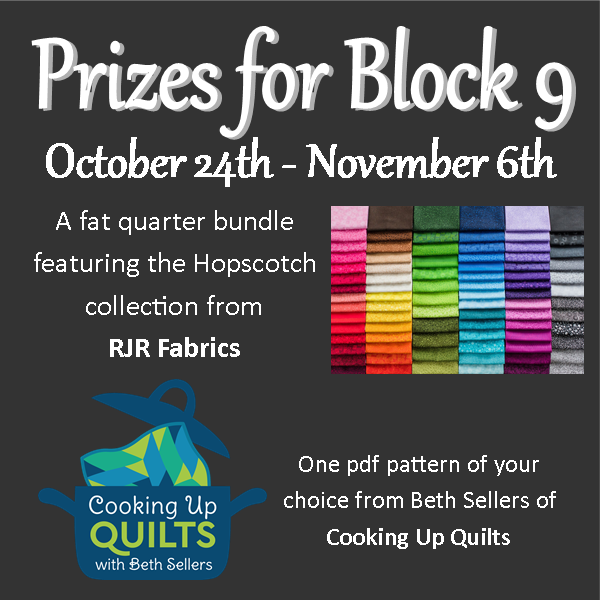 Many thanks to Beth for the pattern prize and to RJR Fabrics for the fat quarter bundle. We have two blocks to complete this time, this has been done in order to complete the quilt in time for Christmas. Block 8 has been designed by Olusola Ajisafe 'Sola'. Christmas gifts, a lovely pieced block! I have chosen one red and one green fabric for my 'gift boxes'. All tied together with a silver ribbon. I have been looking for this particular fabric since the Quilt Along began. I think a bit of sparkle never goes amiss when it comes to the festive season!! Once again I have decided to use my frixion pen to mark seam lines before sewing. This is another pieced block that needs to be precisely cut and accurately sewn for the whole block to work. Sola's instructions are very detailed but I am still struggling to see how these strips will become boxes! Before I cut and sew, I have decided to do a 'mock up' of how the block comes together. I must admit I am really pleased with what I see and have had a 'eureka' moment after doubting that I have understood the instructions! Finished block!! I love this block and even though the silver fabric does not stand out in the photographs I am really pleased with it. I think I could've added a third dimension by making the left hand side of the gift boxes with a slightly darker fabric, but overall I am really pleased with it. Thank you to Sola for this lovely design! 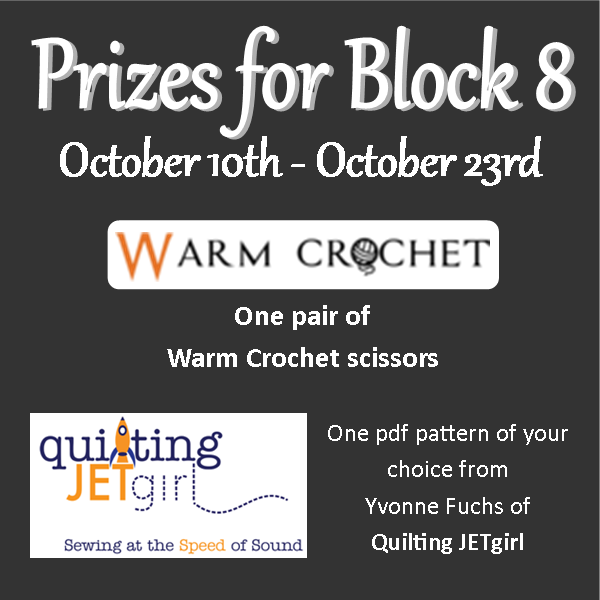 The prizes for this block have been kindly donated by Warm Crochet. They are also offering a 10% discount in their shop with the following code: 'Christmas QAL' and Yvonne Fuchs of Quilting Jet Girl. Many thanks for their super prizes! has designed a poinsettia block, which symbolises Christmas perfectly. Here is my fabric choice, of course it has to be red, but the different patterns add another dimension. I have decided to mark my sewing lines this time and not rely on instinct, it's important that the seams are exact so that the block comes together as Sandy intended. I have used a frixion pen, it's one of my favourite tools to use and so clever. Once the lines are sewn, the marks are erased by pressing with an iron, even on white fabric! Pieces ready as per instructions, ready for construction. I found it useful to mark the printed instructions to make piecing easier. I love this design, the instructions, the colours and the finished effect. Although I think my piecing of the 'leaves' could've been a little more precise! I don't think though that this in any way detracts from the overall effect of the flower. I have decided to 'needleturn' the centre of the flower. This is my preferred method of applique even though it can be time consuming I always think the result is well worth the effort! Block 7 all finished, I am very pleased with this block, I love the freshness of it. Big thank you to Sandy for this design and the easy to follow instructions. 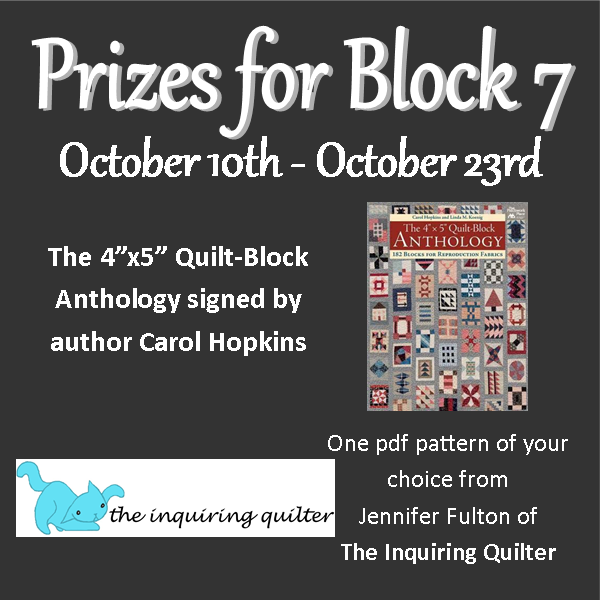 Super prizes from Carol Hopkins and The Inquiring Quilter. Open to entrants worldwide!